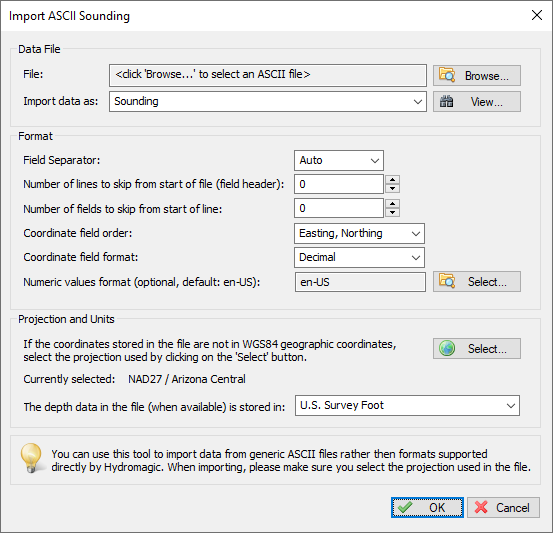 The ASCII import function in Hydromagic allows you to import soundings written in ASCII format. For instance, to import a sounding exported from another Hydromagic project, or created with other software. 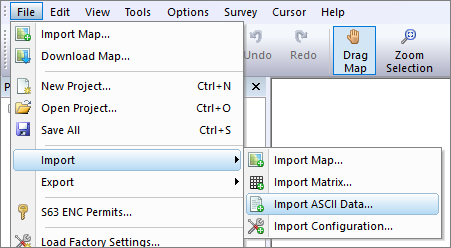 The dialog can be opened by selecting "File"=>"Import"=>"Import ASCII Data..." from the main menu. Click the "Browse..." button to select the file to be imported. All files will be displayed, there is no file extension filter applied. Some file extensions that are commonly used for ASCII files include: *.ASC, *.TXT, *.LOG and *.CSV. The imported file is never modified by this software. This dialog can also be used to import boundaries, matrices and waypoints. 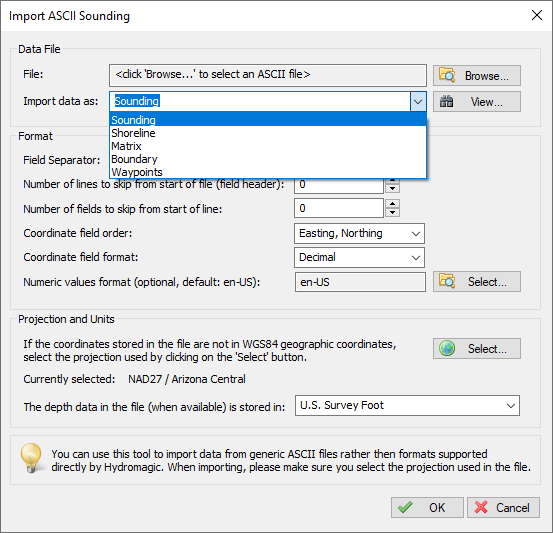 Make sure the "Import data as" options is set to "Sounding" when you want to import soundings. This value is set to "Auto" by default, which means that the software will try to detect which character is used to separate the fields in the ASCII file. In most cases you do not have to adjust this value. Use only when the automatic setting does not work for you. you can skip these lines by increasing the "Number of lines to skip from start of file" setting. The "Number of fields to skip from start of line" option can be used in cases where there are fields before the actual XYZ data, for instance, record id's. You can use the "View" button to show the contents of the ASCII file to see whether these options apply to your input file. This option is to set the order of the coordinate fields in the file. When a third field is present in the file, it will be interpreted as depths. Most software stores soundings in XYZ format, so selecting "Easting, Northing" here would probably work in most cases. minutes and seconds format, or degrees and minutes format, set this option to the correct value. 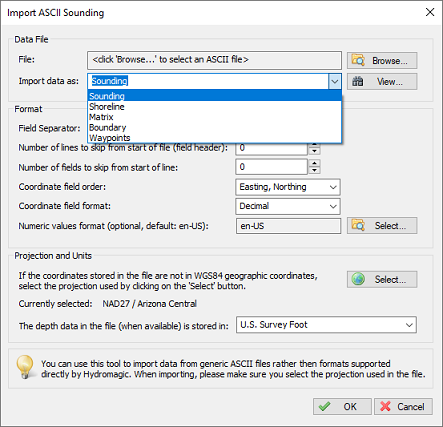 When coordinates are stored in decimal values, leave the default "Decimal" option selected. so it can be referenced to WGS84 coordinates. When altitude or depth values are present in the file, you also have to select the (vertical) units used. Just click "OK" to start processing the ASCII file. When all parameters were entered correctly, the imported sounding will appear in the "Project Explorer".